Gloria Chao is an MIT grad turned dentist turned writer. She currently lives in Chicago with her ever-supportive husband, for whom she became a nine-hole golfer (sometimes seven). She is always up for cooperative board games, Dance Dance Revolution, or soup dumplings. She was also once a black belt in kung-fu and a competitive dancer, but that side of her was drilled and suctioned out. 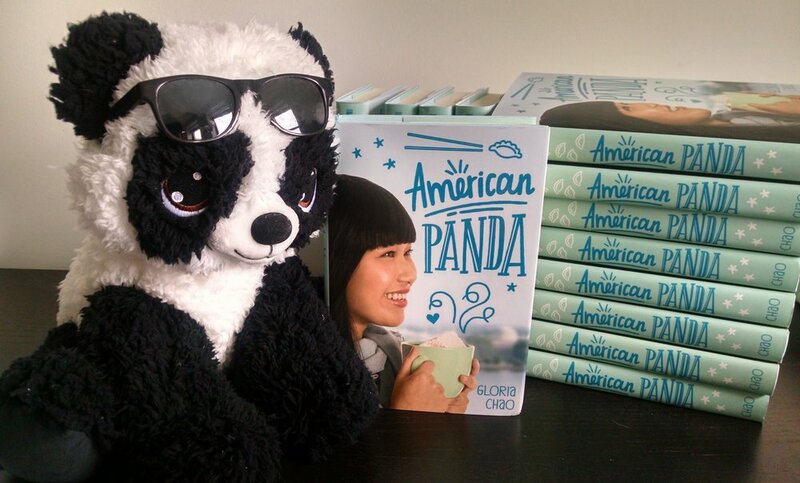 AMERICAN PANDA is her debut novel. My book is inspired by my experiences as a second-generation Taiwanese-American. I wanted to (1) represent the cultural gap that exists between immigrant parents and their children, and (2) explore the struggle of not belonging in either culture. The book also draws from my experiences as an MIT student turned dentist turned writer. Tell your story, the one that only you can write. Get feedback from others, but keep in mind that no one knows your story as well as you do. Trust your gut! I don't have a pet, but I love getting panda swag from friends and readers, and this little guy (named Bao Bao) goes perfectly with a stack of AMERICAN PANDAs! I think every writer is fearless. Being able to share our stories, write for teens, and put our hearts out into the world—it’s a privilege and responsibility that takes guts. As a teenager, I didn't feel like I belonged anywhere; I had a Chinese version of myself at home and an American one at school, and I could never reconcile the two. Also, because I was so sheltered, I didn't understand any pop culture references and my defense was to laugh to try to cover it up, while also working hard to hide my sweaty palms (it is no coincidence Mei suffers from this as well). I spent most of my free time dancing. Even though I loved contemporary, jazz, and hip hop, I was most into Chinese dance and started a nonprofit Chinese dance group in high school that is still around today. That photo is from my freshman year at MIT (like Mei! ), performing in the group's biannual showcase. Fun fact: The fan has a story written on it, and the choreography is of the dancer reading the story and reacting to it. The story on the fan? The Legend of the Butterfly Lovers, which is an important part of my second book, MISALIGNED! Somehow, that picture feels like a perfect representation of my writing journey thus far! As for the story: I loved writing and illustrating when I was young, and my second-grade teacher encouraged all of us to write. The Missing Snowglobe is a speculative historical about how snow globes were first made, and then in one panel, the story quickly turns into a riveting mystery that never gets solved. Reminding myself why I write—to share a story that will help others not feel alone, to tell teens it’s okay to feel lost or confused, and to share a new perspective with those who aren’t familiar. Follow Gloria on Twitter, Instagram, and Goodreads, or visit her website.